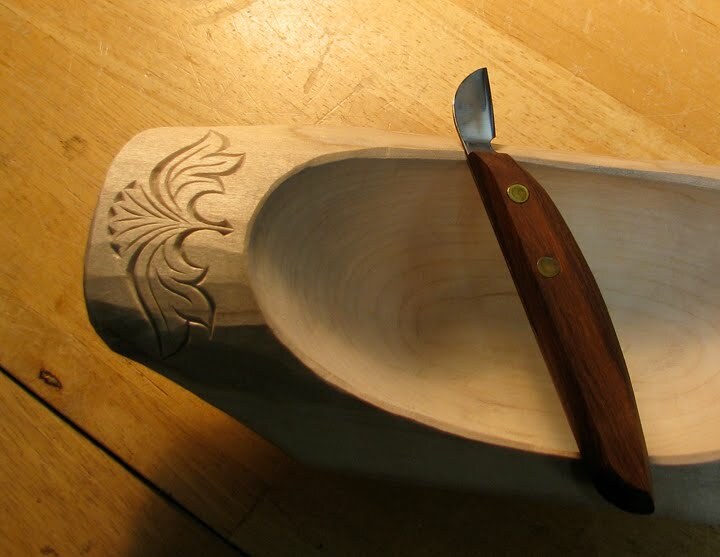 During the one day I spent in Jögge Sundqvist's class at Country Workshops, I started carving a small bowl using an axe, adze, knife, and gouges. I finished the shape in my home workshop and decided to add a little chip carving for decoration. Jögge carves decorative elements into most of his work and he cautioned us in class to resist the urge to add too much. "Don't overdo it" he said. 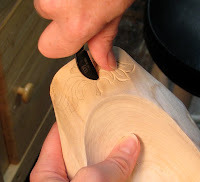 So, I'm just chip carving the top edge of my bowl. Like everything in woodworking, chip carving is a learning experience. One thing I've found to be beneficial is to do a practice run with a new design, especially one that has tricky parts (photo 1). 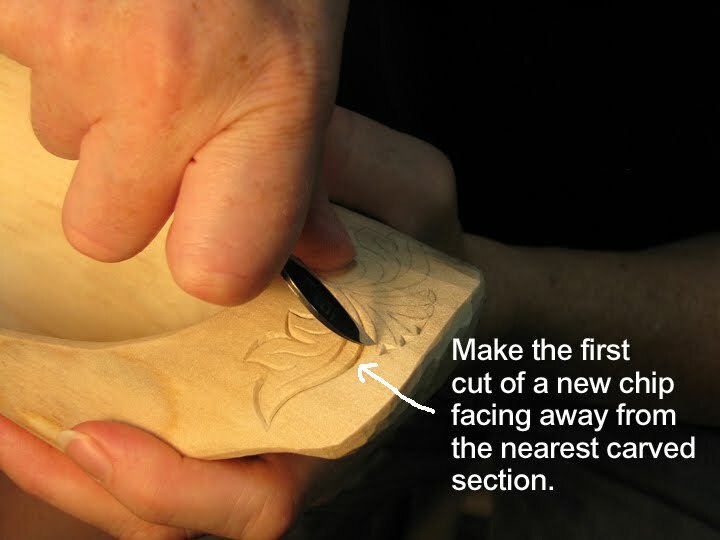 Much like making a prototype before building a piece of furniture, carving a practice piece allows you to work out the trouble spots. Second thing I learned—the hard way—is to start a new cut facing away from the nearest cut (photo 2). If you plunge your knife into a new cut facing a previously chip carved element, you might accidentally lift out a chip that was meant to remain. Tight curves can be tough. You need to change your attack angle so that just the tip of the blade enters the workpiece (photo 3). This enables you to make tighter turns. A few more things: make thin pencil lines and try to carve them away so you don't need to remove them after you're finished; work under a raking light so you can see hard shadows; turn your workpiece often to view it from different angles; strop your knife a lot! ; don't try to flick/dig/pry loose a chip with your knife—you're liable to break the tip. You have to carve out the chip; try not to stop mid-cut. 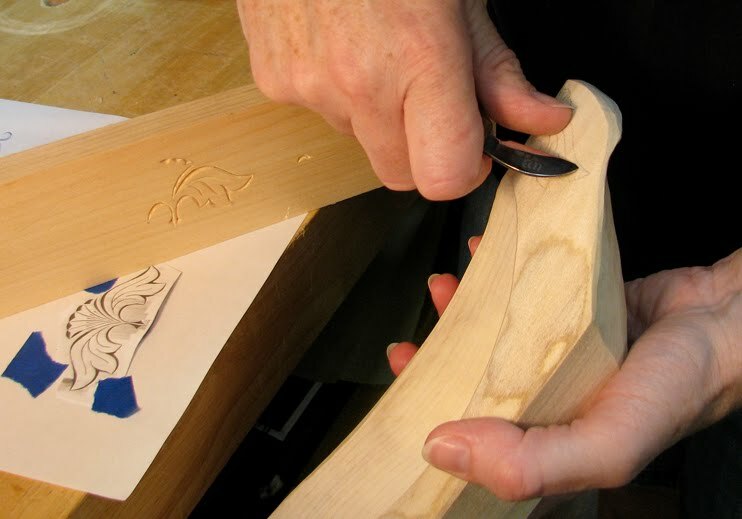 A smoother line is achieved if you carve in a continuous motion; thick and thin lines are more interesting than parallel ones; and smooth cuts are more important than symmetrical ones.